You are here: Home / Blog Post / Do you have to collect sales tax on auction items? Do you have to collect sales tax at your benefit auction? Should guests be paying sales tax on auction items? The answer depends upon your state and municipal rules. If your fundraiser is in Maryland, you must charge sales tax. If you’re living in an area that requires tax collection, I suggest putting a written notice in your catalog or program. Most often this type of information is listed as one of the points in the “Rules of the Auction” section. Some groups will also have the notice printed on a sign posted at the cashier station. Auction teams using mobile bidding might want to ask their vendor where the notice could be added in their system. Because the sales tax requirement will surprise some guests and might cause some unwarranted criticism, some nonprofits will go one step further to draw attention to the mandatory rule. For example, the image featured on this page is photocopied from a Maryland auction catalog. The sales tax notice is featured in a gray shadow box. The state of Maryland requires nonprofit organizations to charge 6% sales tax on all items sold. 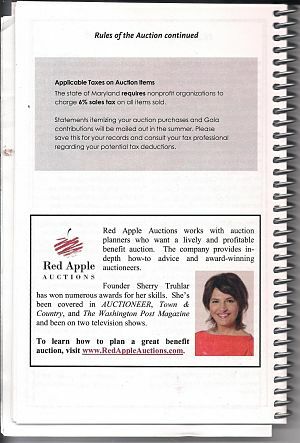 Statements itemizing your auction purchases and gala contributions will be mailed out in the summer. Please save this for your records and consult your tax professional regarding your potential tax deductions. If you don’t know whether you should be charging sales tax, make some phone calls. It is absolutely critical to inform guests whether or not there will be sales tax. Especially with large sales! That could be an awkward moment. Thanks for sharing. You bet! You’re focused on TN real estate auctions and of course, I’m not sure what’s all involved with sales tax with regards to real estate. But the sales tax issue with regards to benefit auctions varies a bit, depending on locale.